On my recent trip to Sydney, I picked up an iPad (around £100 cheaper in Australia given I could claim back the 10% GST as I was taking it out of the country, and it is not subject to the “cost of doing business in the UK” Apple tax). What has amazed me is that everyone that has seen it has been ooh-ing and ahh-ing as if I had a new born baby sitting on the table in front of me. As the proud father of a beautiful 4 year old daughter, I know what this feeling is like. The number one question I get from people who both own the iPad and those that are thinking of purchasing one is “what do you do on it?”. The answer is simple – I read newspapers on it. 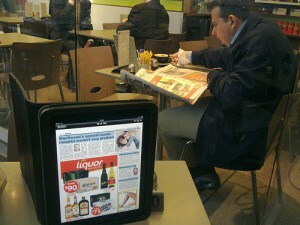 Here is a shot of the old vs the new way of reading newspapers at Bistroteque cafe in Sydney. I’m a news junkie at the best of times, and I can remember grabbing the rolled up newspaper from the front lawn of our old house in Adelaide and reading it cover to cover before I went to school when I was around 11 years old (I just love being an early adopter / innovator). No matter if I am in London for the week, travelling to Sydney on business or popping across the channel for a business meeting in Europe, I (used to) buy newspapers to see what is happening in the markets that matter to me. A by-product of this is lots of wasted newspaper pages, and grubby newspaper hands (not a good look). Also broadsheets are almost impossible to unfold and read while sitting in economy on a plane. 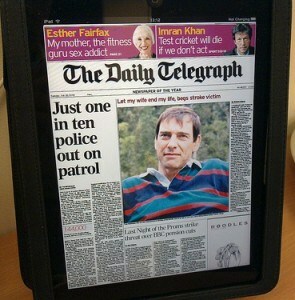 All this has changed due to the iPad, as now I consume all of my newspapers and some of my magazines on this device. After 2 weeks of pretty intensive iPad newspaper reading, I thought it would be worthwhile to look at the different approaches being adopted by newspaper publishers, with a view to which presentation formats work as well as the various subscription models that are emerging. 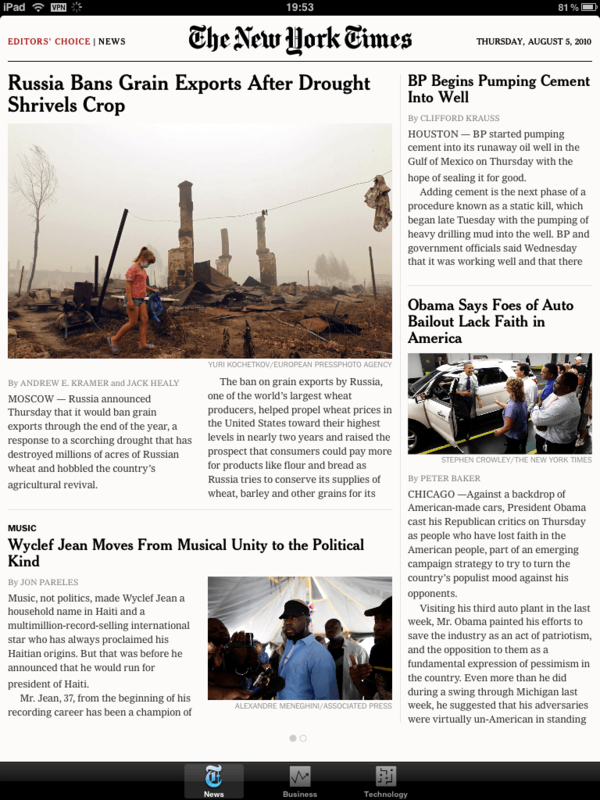 What I have noticed from the initial 2 weeks of usage is that there are fundamentally 3 types of iPad newspaper formats and models (each with pros/cons). Special mentions here go to the Financial Times iPad app, as well as those available from the Australian, Wall Street Journal and the New York times (examples of each shown below). In my view this is the cleanest and most suitable way of presenting news on the iPad. A dedicated app takes care of scheduling updated downloads, easy section selection as well as providing a really easy and intuitive interface. I would single out the FT iPad app as probably the best of the bunch, and up until 31st July Hublot were sponsoring the app so it was free to view. Now that this sponsorship has ended, the FT is forcing me to subscribe to the full ft.com experience to continue using the app. This I feel is the wrong approach, because I now have no interest in reading beyond a few articles on FT.com – I want to consume all of my FT.com content on the iPad. The subscriptions for FT.com (and hence the iPad version) start at around £3.29 per week but I must take a full ft.com subscription to get the iPad edition. 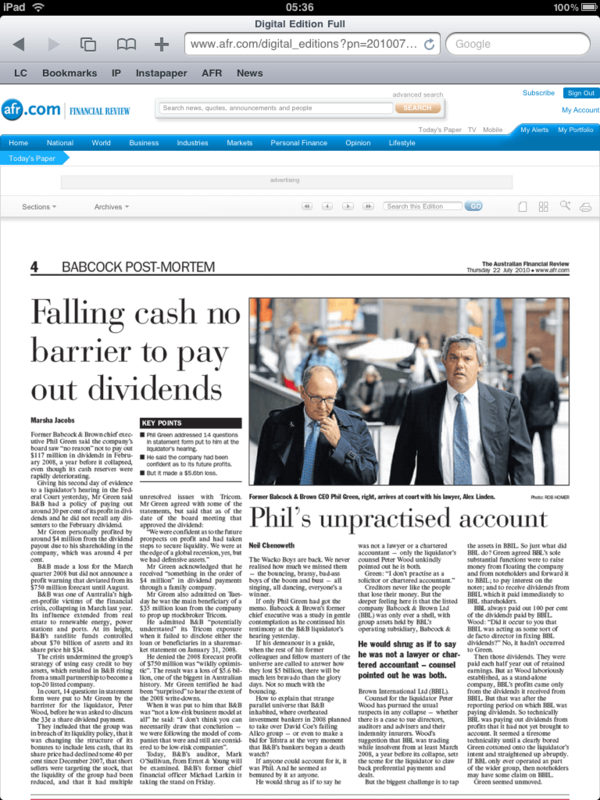 In contrast, the Australian newspaper’s iPad app is $AU4.99 for 30 days access, and can be purchased via an in-app transaction, removing the need to set up and maintain a separate publisher account. The only negative is that possibly not all sections of the paper are presented on a dedicated iPad app, but I am sure this is easy to fix. I am a big fan of this approach. 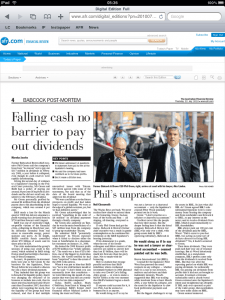 It does not have the ideal user experience of the dedicated app, but it does render the newspaper in exactly the look and feel of the printed version. You can zoom in on articles and some publications allow you to click on a text only version. Presreader has been around for a while offering a PC based version, and they have a very wide range of titles from around the world. The iPad version allows you to schedule delivery of each electronic paper as soon as they are published. While I was in Australia, this meant that some publications were being downloaded to the iPad well before the first editions hit the news stands or doorsteps in the UK. Shown below are my downloaded publications (some downloading when I did the screenshot). Their subscription model is quite reasonable. They have a trial version where you can access 4 issues of any publication for free. The next step up for $US10 provides access to 31 issues (so a whole month of a particular title, or a mix of 31 different editions of various publications). They also have a personal unlimited version for $US30 you can download an unlimited number of publications per month. The other benefit is that all of the issues are stored locally on the iPad, so as I type we are about to land into London and I have read about 15 newspapers and magazines from around the world cover to cover during the flight. 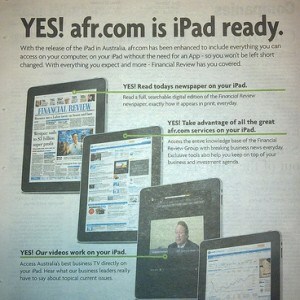 What struck me during my visit what the Australian Financial Review’s (AFR) full page advertising shouting that you did not need a dedicated iPad app, as their website was “iPad ready”. 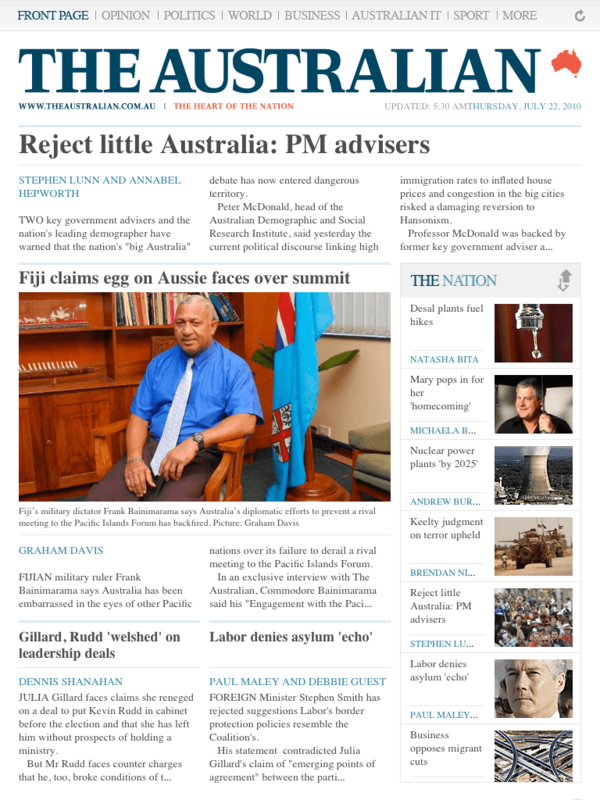 The AFR has a similar style and readership to that of the Financial Times in the UK. I used to subscribe to the AFR (messy newsprint edition) when I lived in Sydney, so I opted for the 2 week free trial to see if the “iPad ready” web version of the AFR provided a similar experience to that of the dedicated apps and Press reader mentioned above. It doesn’t. It is awful. I cancelled my trial. Click the image below to see what I mean. 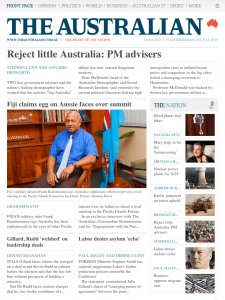 Firstly, you have to log into the AFR website to read the digital edition. The issue is not pushed to you and the login boxes are definitely NOT iPad friendly. I could not imagine doing this 6 days a week without cursing Fairfax (publisher of the AFR) every single day. You cannot easily turn the pages by swiping as you can on the iPad apps and Pressreader. You have to navigate back to the top of the page to turn pages! Interestingly, the Sydney Morning Herald (sister publication of the AFR from Fairfax) has chosen the Pressreader route, with their own subscription. This is certainly a better way to go initially while they build a dedicated iPad app (and they will have to do this to retain iPad subscribers). Dedicated iPad newspaper/magazine apps provide the best experience, and functionality. The issue will be to de-couple the standard web/newspaper subscriptions and offer an iPad only subscription. Web apps just don’t cut it on the iPad for newspaper consumption and they also insult the iPad user by providing them with a very poor user experience. Now when I see people reading newspapers at coffee shops and on planes, I look back to when I was doing that, and how simple and tidy the iPad is for reading newspapers on the go. Follow me on twitter @andrewgrill for the latest updates, news, views and reviews. The difference between the user experience for web-based and client-based apps is almost entirely to do with design assumptions and preconceptions on the part of the developers, and nothing to do with the network or the abilities of the technology. In a promising (although ongoing) experiment with http://whitherapps.com/ I am entirely confident I can reproduce the BBC News UI within a mobile browser (complete with offline browsing). 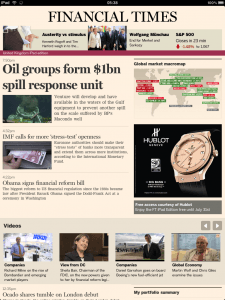 I’ve looked at the FT app too. Same story. The myth is that you *have* to write native apps to consume commoditised news feeds exposed via open standards. (Even the monetization argument doesn’t really hold up for me).